After the game yesterday on one of the Premier Pitch's uncovered pitches at The Grandstand, the players seemed quite pleased with the pitch, which has worn down since the first time we played on it. When we previously played on one of the Premier Pitch's uncovered pitches at The Grandstand, in October 2012, the players found the turf too thick and "lush". After yesterday's game, Chen Hong went so far as to suggest that we move all our games at The Grandstand to the uncovered pitch! Both Saturdays were cloudy and cool with some light rain, good conditions for football. If the sun is out, the heat between 5 and 6 pm will be a problem. Also, if the rain is heavy, or there is lightning, then a game on an uncovered pitch would have to be cancelled. i played on the premier pitch/grandstsnd yday. much slower pitch now. ball does nt bounce. fairly disappointing renovation. Chen Hong also complained it was too thick when he spoke to me on Saturday. Presumably, he played there on Wednesday as well. 1. Switch the weekend games from the covered pitch to an uncovered pitch. I think there are too many complications as discussed above, but I'll consider what players have to say. 2. Switch the weeknight Khalsa games to the covered pitch at The Grandstand. Unfortunately, I am not aware of the covered pitch being available on weeknights, other than, now, Monday. Provided that a change is possible in the first place, unless there is a good reason for change supported by a large number of players (taking into account a poll if necessary), my inclination is to stick with what we have. Change always involves more work, especially for me. Folks should definitely the big covered pitch at Turf City. Much much better than Khalsa. Monday night not good for you Kien? I am not aware of availability on any other weeknight. For Wednesday night, you can ask Elvin about his game at The Grandstand. 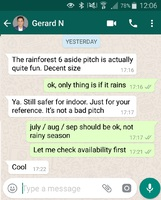 As, going forward, I will address all issues relating to pitches at The Grandstand under this thread, be they the covered pitches of the Premier Pitch, or the uncovered pitches of the Premier Pitch and the Rainforest Sports Hub, I will rename this thread "Pitches @ The Grandstand". 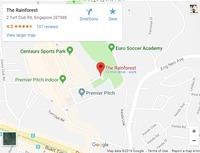 As access is easier from Balestier Road, and as I have considered playing on the 7-a-side pitch at Indian Association, just further up Balestier Road, I shall rename this thread "Pitches @ Balestier Road'. This is also consistent with the renaming of "The Premier Pitch @ The Grandstand" thread as "Pitches @ The Grandstand. I will also start referring to our regular venue at Balestier Road as "The Premier Pitch @ Balestier Road" instead of "The Premier Pitch @ Khalsa"). Now that the GIFFA System thread is divided into sections, I will add a link to this post after the reference to "Premier Pitch @ Balestier Road" in the "Scheduling" section, in order to provide easy assess to information on getting there and parking. As the Sports Planet @ East Coast has unique issues, it will continue to have its own separate thread. Of our remaining regular venues, The Cage @ Kallang will continue to be dealt with on this thread, as issues about the pitch and the location rarely arise. As the dimensions for each pitch provided by those who run the various venues can be misleading, my earlier analysis of area per players doesn't really hold water. Covered big pitch at The Grandstand - Maximum 16, minimum 14 (both played to the side lines). Uncovered big pitch at East Coast - Maximum 14 (played off the side padding), minimum 12 (played to the side lines). Covered pitch at Kallang - Maximum 10 (played off the side walls/padding, minimum 8 (played to the side lines). Uncovered pitch at Khalsa - Maximum 14, minimum 12 (both played to the side lines). We had another 6-a-side at East Coast on 19 June 2012, only the second time since October 2010. It might be one reason some players have told me they don't want to play if it's 6-a-side at East Coast. Even with 7-a-side, the games on the big pitch (played off the side padding/fencing) can be very demanding, as we often play well past the hour. 6-a-side played off the side padding/fencing can be more so. For those who play regularly or are more fit, this may not be a problem, but for others, it can be very punishing. It also means that when we are stuck at 10 or 11 players, it makes it much harder for me to get less regular players to make up the numbers (as they don't want to risk being stuck in a 6-a-side game), and increases the risk of games being cancelled. Our games are not meant to be punishing or tortuous. The regulars should agree to play to the side lines when it's 6-a-side, and the team captains should make sure it is implemented. If I'm not mistaken, we haven't had a 6-a-side at East Coast since. 6-a-sides are more common at Balestier Road, the latest on Thursday, 16 January 2014. Remarkably, when we were stuck at 10 for the game at East Coast on Monday, 13 January 2014, several of the regulars were keen to go on 5-a-side on the big pitch as no small pitch was available. We finally got to 14, so the game went ahead 7-a-side as usual. We have previously had games at East Coast cancelled even though we had at least 10 players and a small pitch was available as several of the regulars were not keen to switch to a small pitch, the last time being on 30 December 2013. We had a couple of 4-a-sides at Kallang in the second half of 2013 - on 13 August 2013 and on 1 October 2013. The Kallang regulars are less fussy. There are players who only want to play 8-a-side at The Grandstand, not 7-a-side, so they can only have a contingent place. We aim to get the maximum number, but games will go ahead with the minimum number. We aim to have even numbers divided into two teams of equal numbers, but for one reason or another, we may end up with uneven numbers. We make adjustments to our games to deal with uneven numbers, whether it is one more than or one short of the minimum number. Playing with less than the minimum number will be very exceptional. I can only imagine it arising if we only had the minimum number to begin with, and their is a very very late withdrawal (less than half an hour before the game), a no show or an injury during the game, as players are already at the venue or on their way. If a withdrawal more than half an hour before the game leaves us short of the minimum number, I would be more inclined to cancel the game, as there is sufficient time to inform players before they are more than halfway to the venue or already there. I've added "Playing with less than the minimum number will be very exceptional" to the above passage. .... ..., at the bottom of each section/post [of the "GIFFA System" thread], I will include links to the announcement and discussion threads that are relevant to that section/post. Two weeks ago, Marko sent me a link to Zion Sports in Tiong Bahru, as a venue in the vicinity of the central business district. They have two uncovered 5-a-side pitches. I'm not currently looking to add a 5-a-side game to our schedule, and the advantage of The Cage @ Kallang for 5-a-side games is that it is covered, but perhaps I will look at it again in the future. With all the issues and problems with the big pitch at East Coast, I will be switching the Monday night game at East Coast from the big pitch to a small pitch in August 2014. The next question is whether the maximum number should be 12 (for 6 a side) or 10 (for 5 a side). We used to play 6-a-side on the small pitch when we first started playing there. The last time was in September 2008. We then stopped playing at Sports Planet at East Coast for a while, before we resumed playing there, on the big pitch, in July 2010. If the maximum number is 12, I can keep it at $10 per player, and we can still go ahead with 10 (minimum number). If it is 10, it will have to be $11 per player, and we will need exactly 10 players. I will leave it at $10 per player to start with, and see what the numbers are like. I did a spatial analysis about 2 years ago, based on the information available at the time. I've updated the table below, taking into account that we now play on big pitches at both Sports Planet and the Premier Pitch. I've also included a standard 11-a-side game. Lee: "Hey Raj, I'm not gonna play [Sunday game at The Grandstand] for a while, i find the game too hectic, I would prefer one less player per side .... Maybe you put this to a vote with your members.? Thanks Lee"
Lee hasn't posted on either thread yet, but I am prepared to consider limiting the Sunday game at The Grandstand to 7-a-side. The Sunday game at The Grandstand has been a struggle to fill up for much of last year and the first half of this year, so much so I gave the game a break in April 2014. The game resumed in May 2014 at an earlier time slot of 4 to 5 pm (although it will be moved back to 5 to 6 pm from July 2014 onwards), alongside the extra game from 8 to 9 pm on Sunday nights at Balestier Road. If we limit the Sunday evening game at The Grandstand to 7-a-side, the price will have to be $13 per player. However, we would be able to go ahead 6-a-side on a big pitch even if we are stuck with 12. I don't need to scramble around trying to fill the 2 extra players, and can focus on getting the night game going. If more players want to play on Sundays, then the night game can get going too. I have added the poll above. I have no intention to re-consider the maximum numbers for the Saturday evening game at The Grandstand. That game has its own dynamic, is still popular, and is in any event the only game on Saturday, so I will keep it at 8-a-side to accommodate more players. I found 8 a side too crowded, 7-a-side might be better. 8 a side is fine with the right formation & people understanding their positioning and how to find space! In any case it teaches players to keep the ball moving fast and improves their pass and move game. 8 aside is fine. Like Babs said you just have to think about where you are moving and pass the ball more. If you change it to 7 you will alienate a lot of the regular players... 7 aside is pretty fitness intensive and I am pretty sure 90% of us are not fit enough to do the extra running anyway. The poll is still open. It is currently 4:1 in favour of allowing up to 8-a-side for the Sunday game at The Grandstand. I'll leave the poll open indefinitely. With all the problems we've had with the big pitch at East Coast, Jeff S drew my attention yesterday to the new Home United pitches at Aljunied/MacPherson. I looked it up. The place is run by Offside. Location map here. On a separate note, when driving through the Stadium area a couple of weeks ago, I saw two covered pitches in the open area behind The Cage. The only signage in the vicinity was for the neighbouring batting cage. I looked it up. The batting cage is owned by the Singapore Baseball & Softball Association (SBSA). The SBSA also owns the two covered pitches. The SBSA has outsourced the running of the batting cage and pitches to Sportskinesis. However, Sportskinesis are required to give priority to the batting cage, so they are not promoting the covered pitches. The pitches are available. The pitches looked suitable for 6-a-side. I will follow up to confirm. I will start a Friday night game there. I have also been considering an additional Saturday game for those who live in the East. That can also be at the SBSA pitches. Wednesday, 27 August 2014. 7-a-side. Tuesday, 23 December 2014. 7-a-side. Last night (Tuesday, 17 February 2015). 6-a-side, but a no show left the game 6 v 5. I will go through the issues one by one. The basic information is provided by Sports Kinesis. Drinks. &nbsp;They are in the process of setting up an F&amp;B area. &nbsp;They are waiting for URA approval. Location is not really an issue. &nbsp;I would think it is actually very convenient. &nbsp;It is just a matter of finding it the first time. The metal poles are outside the netting. &nbsp;The beams at Khalsa are slightly further away from the netting. &nbsp;The beams at East Coast are part of the wire fencing. &nbsp;It may not be as safe as Khalsa, but definitely safer than East Coast, especially with netting instead of wire fencing. &nbsp;Also safer if we play to the lines, instead of to the netting. &nbsp;However, playing to the lines may require playing 6-a-side. 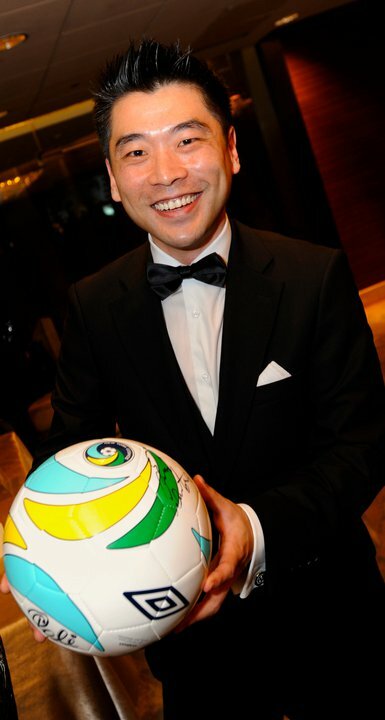 &nbsp;Nevertheless, I will keep it as 7-a-side for now. The pitch at SBSA @ Kallang is actually very similar in size to the big pitch at East Coast, where we also played 7-a-side. Both are the size of tennis courts. The real difference is that because we were playing off the side fencing/padding at East Coast, it gave the feeling of being wider. We can consider playing off the side netting at SBSA @ Kallang too. There are two paths from the container office to the pitch. One is towards the open softball playing areas, and is muddy. The other is along the perimeter fence. That is not muddy. The one concern raised to which I have no response at the present time is that the spotlights are low, and can be hit by the ball. Still, less intrusive than the loose perimeter padding at East Coast that was there for most of the time we played there between August 2010 and July 2014. .... It was a very decent contest and a great workout for all. The game was played in good spirits. We played on well past nine and ended off around 9.30pm. Since this is a new venue some observations from me: 1) The pitch is long and narrow, which I think is something players can get used to, it can encourage a long ball game, personally I adapted ok. 7-a-side is optimal and safe even if you play to the lines. 2) The pitch does tend to hold a bit of water. If you don't wear a good pair of turf shoes, u will be in trouble. 3) The lack of changing and showering facilities, poor lighting surrounding the pitch and proper seats to sit down to put on your gear is not a positive. It does not bother me that much but I did overhear some complaints. I had good fun. Pitch gets abit waterlogged. The facilities not a concern of mine. The pitch is the same size at the big pitch at East Coast - the size of a tennis court. When we played there we, played off the side netting with 7-a-side. The few occasions we played 6-a-side on the big pitch at East Coast, we also played off the side netting, even though I thought we should play to the lines on those occasions. The game was very tiring, and several players were not willing to play 6-a-side on the big pitch at East Coast. For safety reasons, we will play to the side lines at SBSA @ Kallang until the perimeter poles are padded. Then the question is whether we should limit numbers to 6-a-side, or continue to allow up to 7-a-side. I have added a poll to this thread. The pitch at SBSA was not too bad, nice bounce for a regular ball as well as sufficient traction. It is however a little narrow and with the poles on the side of the pitch a slight hazard when running down the flanks. Also I wonder how long it takes before one of the balls will hit the lights above as there is no netting between the ceiling and the roof unlike most other covered pitches. Also due to its narrow size, I would say that its prob more ideal for a 6v6 or 5v5 rather than 7v7. The subject title for thread on the "Stand-Alone Polls" board is currently "Until the perimeter poles at SBSA @ Kallang are padded". While keeping the poll as it is, I'll broaden the subject of the thread to "Issues relating to SBSA @ Kallang" so that the full range of issues can be discussed on that thread. We had our fifth game at SBSA @ Kallang last night (Tuesday). We had our fourth game at SBSA today (Tuesday). It was the first time I played. It ended up as a 5-a-side, and it seemed ok. I think we can consider limiting numbers to 12, and go ahead with 10 even. However, I'll wait for more players to vote before deciding, and in the meantime, will continue to allow up to 7-a-side, even though we can go ahead with 6-a-side or even 5-a-side. Also, the guy in charge at SBSA has informed me that other groups continue to play off the side netting evening without the perimeter pole being padded. He informed me that the issue that does come up is the ball rebounds unpredictably off the poles. For now, I'll leave it to team selectors/captains to decide whether to play to the side lines or off the side netting when we have 7-a-side. As for facilities, although there is URA parking across the road, it is possible to park for free at the food stalls/offices next to The Cage and walk over. For shower facilities, I guess we can sneak in at The Cage, or look for toilets with shower facilities at Kallang Leisure Park Mall. With 7-a-side, I'll leave it to the captains whether to play to the side lines or off the side netting. After the game, Ling Chong messaged "good game" on the WhatsApp group chat, but there is no report up yet. Going forward, if it's 5 or 6-a-side, we'll play to the sidelines, but if it's 7-a-side, I'll leave it to the selectors/captains to decide whether to play off the side netting or to the side lines. The issue is similar to the one we had at Sports Planet @ East Coast, where we used to play off the side padding. I have also been informed the poles will be padded soon, but the guy in charge couldn't give me a definite date. As for washing facilities, I have been informed that the portable toilet near the gate has running water. On a separate note, SBSA has informed me that they are putting up the price of the pitch, so unfortunately, I have to put it up from $8 to $9 per player from next week onwards. Still cheaper than our other venues. Why have we gone out and asked for 2 more when 7 aside was fine? Each game has a maximum number and a minimum number, 2 less than the maximum number. If we don't have the maximum number the day before the game, I continue to ask around. However, as long as we reach the minimum number by the time the team selector/captain poll closes (5 or less hours before the game), I can stop asking around (although I usually continue to ask around until 2 or 3 hours before the game), unless we have uneven numbers (that is, 1 more than the minimum number or 1 less than the maximum number), or, with the minimum number, one or more of the players say they will only play with the maximum number, in which case, we need to find a replacement for that player, or 2 more to get us to the maximum number. For the game on 21 February 2015, the extra player went down to watch, and the players managed to pick up one more player at the venue, so the game went ahead 8-a-side. I have at various times over the years discussed capping numbers for either the Saturday or Sunday game at The Grandstand at 14 (for a 7-a-side), as early as July 2010 and most recently in June 2014. There is currently a poll on the subject, but only 1 vote so far. ..., the SBSA pitch seems best suited for 6-a-side matches, not a man more or less. I got a message from the guy at SBSA that Sport Singapore (who presumably licence SBSA to use Kallang Fields) will not be allowing football there for at least the rest of April 2015 in order to plan for the 2015 SEA Games, to be held from 5 to 16 June 2015. I'm not sure how that works but no one is going to argue with Sport Singapore. I will re-amend the GIFFA System thread accordingly. If we allow up to 16, even if there are late withdrawals, we should have enough for 7-a-side on the big pitch. If we limit numbers to 7-a-side, we may have to go ahead 6-a-side on the big pitch. 2 more players get to in play popular games. Works out to $12 per per player. Limiting numbers to 7-a-side means $13 per player. less intense, less physical game,and fewer collision-type injuries. Better flow to the game. Each player having to cover more ground improves fitness. Generally, older, less fit but more tactical players prefer 8-a-side, while younger, fitter but less tactical players prefer 7-a-side. There are of course, many exceptions to this generality. many of the regulars including myself have been playing based on 8 a side for years and we like that system a lot. I dont think we should look at a change because one or two players dont like it. If you change it to 7 a side, you risk alienating some of the players. fm this post, you know where i stand on this. As I've stated above, we've been over this issue several times since 2010. However, the discussion is interspersed in the "Venues, pitches & team sizes" thread. From time to time, newer players raise the same issue again, so I refer them to the previous discussion on the matter. It's useful to have all the arguments on this single thread for future reference. I don't see any change in the foreseeable future. However, I will let the thread and the poll continue to run, for the reasons set out in the last quote above. Please take note that our East Coast outlet have closed its doors from 1st February 2017. To thank you for all the support you have shown to us over the last 10 years, just quote "ECP REGULAR" when you are making your booking and enjoy $20 off our standard rates for every 2hrs booked. 2. Not applicable with other promotions. 3. Not applicable for events, birthday party, corporate or commercial purposes. 5. Limited period only. (till 28th Feb 2017). Although we haven't played at Sports Planet for some time now, if you go through the FIFFA blog, and this thread, you will see we used to have regular games at East Coast, first on the small covered pitches (initially 6-a-side, later 5-a-side), and later on on the uncovered big pitch (7-a-side). I passed Sports Planet @ East Coast today - the roofing over the covered pitches has been removed. HYFA have been in the news recently. Due to complaints by residents living nearby, the Singapore Land Authority substantially reduced the operating hours for the 11-a-side pitches at short notice[/rul]. It was later somewhat relaxed, but customers have not been happy. Fortunately, our games on the 7-a-side pitches was not affected. As I've stated above, we've been over this issue several times since 2010. However, the discussion is interspersed in the "Venues, pitches &amp; team sizes" thread. If anyone changes their vote, it would be useful if you posted the reasons for the change below. As last Saturday (28 Jan 2017) was the first day of the Chinese New Year, we struggled to get to 14 players, but finally got there, and the game went ahead 7-a-side. The above poll however is 9:3 in favour of allowing up to 8-a-side. Three more players have voted, Nick Hunter, Jessen and Dennis. I'll switch the Thursday night game as well, starting from 9 March 2017. The address is 48 Woodleigh Park. It is within the grounds of the PUB Recreation Club. There are two ways into Woodleigh Park, marked "1" and "2" on the above map. "1" is only accessible from the slip road. "2" is accessible from the main road. Shah had some concerns about the size of the pitch and sent me some photographs that had been sent to him. I went down on Wednesday evening to have a look and to take some photographs. I have created a new label for the new venue, "US" (Upper Serangoon), in silver/grey. Due to a mix up over bookings, the game last Sunday (21 May 2017) at the Grandstand was moved from the covered pitch (operated by Premier Pitch) to Rainforest Sports Hub. On the day itself, Paul arrived early and WhatsApped me that our usual booking on the covered pitch was not available. Further it was raining. There was no pitch available at the Premier Pitch's uncovered pitches, so I tried Rainforest Sports Hub. They informed me they had a 6-a-side pitch available, but that it was suitable for 7-a-side. All but Tim T were ok going ahead on an uncovered pitch despite the rain. Damian offered to drop out to leave us 7-a-side. .... As the majority of players are indifferent, it is currently tied between being ok to switch to 4 to 5 pm and remaining at 5 to 6 pm, and I am tired of being pressured to switch to either 4 to 5 pm or 6 to 7 pm, for June 2017, I will switch the booking to 4 to 5 pm. 7 a side was abit too hectic for the size of the pitch and goal post which was bigger. I think an 8 a side would have been more manageable. .... As Paul said, general pitch was ok for a 7 aside (better 8 aside) but the goals were far too big for that size pitch. Despite the rain, it was a good game. I've replaced the poll to reflect the revised options. The poll standing will be implemented in July 2017. As there is also an option as to the pitch, I have changed the subject to "Alternatives for the Sunday game at the Grandstand". With the covered pitches closed for two weeks for refurbishment, we tried one of the pitches (47m x 25m) at the Rainforest Sports Hub last Saturday (28 December 2013). One other thing about this pitch - you have to pay parking, which adds another $2 to the cost of playing Unless you don't mind walking 500m in from our usual spot. A beautiful pitch indeed. Think most players thought it's the pitch right next to our usual one whereas this one is a bit further inside, almost in the jungle... Rain shud not be any obstacle to playing. It was not slippery nor too soggy despite the heavy rain at some point during the game. It felt like a totally different game compared to any other of our sites. Much less ball contacts. Tough to control the wet ball. Think long balls were generally very effective. Good job from Timmy on that front. Enjoyed the game, though I must say playing on the premier pitch comes closest to what we see on tv in terms of successful combos, runs, passes, ect. I think the narrowness of the pitch is a factor. I think it's narrower than the Premier Pitch's uncovered pitch (25m to 32m). For next weekend, I will switch to the Premier Pitch's uncovered pitches. We have 17 players. I have tried to find a 7 or 8-a-side pitch at the Grandstand (Premier Pitch Indoor & Outdoor, and Rainforest Arena), but to no avail. The alternative is 3 teams over 2 hours (to 8 to 10 pm). The pitch is available 8 to 9 pm as well as the usual 9 to 10 pm. I'll see what the players say, and maybe add a poll. No interest in playing 3 teams over 2 hours. The first post above is for the usual Tuesday night game at the Premier Pitch Indoor (5-a-side). I have amended it accordingly. As we are now at the end of July, going into August, let us try out Pitch E at Rainforest Sports Hub for a few weeks. If I block book and pre-pay, I may be able to negotiate a discount.